Mountain View Hotel, situated at a distance of just 3 miles from the town Kyrenia, in karaoglanoglu, offers splendid view to guests alongside seashore with mountains and seas on their adjacent sides. 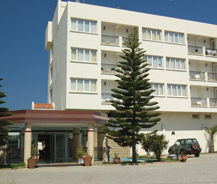 This is a three star family hotel running in the lands of Kyrenia, offers best hospitality, kind service and rooms to their comfort. The rooms here are designed with great care and contain facilities such as separate telephone lines, hair dryers, bathrooms attached with shower, TV sets, tea cups and saucers with a kettle. All rooms contain balcony with two chairs and a table enables all the guests to experience a great natural view of mountains and seas by sitting in the room. This facility is made available in all twenty one hotel rooms and each room is re-furnished to satisfy the customer needs. As this hotel is just 3 miles away from the town it is easier to reach any other tourist spots available in the city and nearby local beaches are reachable by walk. The hotel has a beautiful fresh water swimming pool with sun loungers and sun shades along with children's section. All the facilities provided here are of high standards and hence the guests are approaching in large numbers during holiday trips.